We are sitting in the boardroom of C²I² Systems. The Cape-based company, worth R100 million, deals with secret information, so security is tight. There's a mysterious, industrious atmosphere in the offices, whose walls are covered with pictures of battleships, helicopters and unfathomable digital graphics to do with naval combat suites. An immaculate personal assistant has covered the board table with about 30 large scrapbooks of press cuttings on South Africa's arms deal. Within minutes of entering the ice-cold room, managing director Richard Young, who was raised in Pietermaritzburg and matriculated at St Charles, is dropping bits of information that could launch a hundred new journalistic probes. He speaks quickly, intensely. Names - Heath, Shaikh, Fakie, Baqwa, Zuma, Modise - drop off his tongue. "Things are starting to cook," says Young. Within weeks, Young (44) is likely to provide information that could blow open what he terms "the whole enrichment deal" related to the armaments acquisition. Young is the man who lost the bid to supply the information management system for the German-built Corvettes. The loss has been devastating, as he has invested a large part of his life and capital in the project. For years he was led by the navy to believe the contract was his. Young believes his bid failed because of serious irregularities in the procurement process - and is suing the government, Armscor and the French-owned company that won the contract, African Defence Systems, for R150 million in damages. He also has four defamation cases against key players in the deal. Young is "upwards of 90%" confident he will win all his cases - "because I have uncontestable evidence". Last year, Young applied to court to gain access to documents relating to the deal and to the work done by the joint investigating team appointed by Parliament to probe the arms procurement process. He wants to see the initial drafts of the joint team's report, which were submitted to the Defence Department and to a cabinet committee before being sent back for revision, effectively, he believes, sweeping vital information under the carpet. Young believes the initial drafts contain information crucial to his cause. Last November, the Pretoria High Court ruled that Defence Minister Mosiua Lekota, Auditor-General Shauket Fakie, former Public Protector Selby Baqwa and National Director of Public Prosecutions Bulelani Ngcuka must provide Young with the documents, but Fakie and the other members of the joint investigating team are seeking leave to appeal against the judgment. Young is waiting for a ruling on the appeal request, which is expected any day. The case will set an important legal precedent for the interpretation of the Promotion of Access to Information Act, which gives citizens the right to apply for access to public documents. It could also be the nail in the coffin for the arms deal. Young grew up on a sugarcane farm near Table Mountain, outside Pietermaritzburg. Like his father and grandfather, he went to Michaelhouse - "a character-building, but austere experience", later matriculating at St Charles College - "such a refreshing environment. I still have many friends from there." His father, Mike, was a farmer and a soldier, a major and 2IC in the Royal Natal Carbineers, and his mother, Helen, a biology teacher who taught at Wykeham and Epworth. At school, Young loved science, particularly chemistry. "My mother helped me assemble a home chemistry set from real laboratory equipment and chemicals, which kept me busy for hours. I wanted to be a chemical engineer." However, in the army he worked in the specialised electronic warfare unit, which led to his decision to go into electronic engineering. Young did a BSc in electronic engineering degree at the University of Natal, after which he started working in the data communications field. While working, he completed an MSc in engineering at UCT in 1992. 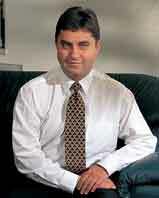 Between 1993 and 1996, he completed a PhD in engineering, focusing on real-time data communications, through Wits. In 1992, Young started C²I² Systems. The company's capability is in applied information technology, specifically in the sector of defence electronics. "Our company slogan is "force multiplication through information technology", says Young. C²I² Systems employs 30 people, most of whom are graduate electronic engineers. Young's interest in the navy started early in his career. "The companies I worked for were involved in naval systems. Later, I was approached by Armscor to continue with technology work they had started in the late eighties on submarine and frigate combat systems." The "information management system" is the crucial "nervous system" of the ship, which transports the real-time data that co-ordinates sensors, control elements and weapons. Young's system was developed in conjunction with Armscor and ADS and had been chosen by the SA Navy. But, at a late stage in the process, the contract was granted to a French company, Detexis, which is owned by the French defence company, Thomson-CSF, now Thales International. Thomson also owns the South African company African Defence Systems (ADS), which has, along with other companies, played a dubious role in the arms acquisition process. 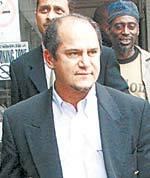 One director of ADS is Shabir Shaikh, brother of the former chief of acquisitions in the Department of Defence, Shamin "Chippy" Shaik, the man considered, along with former Defence Minister Joe Modise, responsible for being the architect of the deal. The deselection of C²I² Systems did not happen overnight, but towards mid-1998, after Thomson had purchased 50% of ADS from the Altech Group, Young got wind of moves to oust his company from the bid. "It didn't come in one fell swoop. We knew from ADS's demeanour, once they were taken over by Thomson of France, that they were trying to work us out." Young is convinced that Thomson was unfairly favoured - a conviction that ties in with recent allegations linking Deputy President Jacob Zuma with a bribe from Thomson to protect the company. "Once I started investigating my own situation, I realised there was a much bigger picture to this arms procurement process, involving irregularities on a massive scale." Young believes emphatically that his company is still the best for the job. "Technically, we have designed a world-class system. No one denies that. It is untenable that the vested interests of certain people should sacrifice top-quality South African technology for inferior, retrogressive technology. "In June 2000, the navy, the Department of Defence, Armscor and the German shipyard did a formal evaluation report and unequivocally found our system was superior. We don't know why we weren't chosen. This is why we want access to these documents." Young goes on: "I have been personally involved in this Corvette programme since 1992. It consumed 90% of our company's resources and energies from 1993 to 1999. I did my MSc and PhD on it. All that work has flowed back to the navy free of charge. I was a member of the design advisory committee." Young also has four defamation actions on the go, against various players in the arms process. One is against Rear Admiral Johnny Kamerman, Corvette project officer for the SA Navy, who claimed during public hearings into the arms deal that Young jeopardised the security of the country, a claim which Young dismisses as "absolute horse manure". The second is against Pierre Moynot, CEO of African Defence Systems, who, according to Young, issued "fundamentally flawed and defamatory" statements to the Public Protector. He also has one against attorney Yunus Shaikh for saying, on e.tv's television programme, Third Degree, that the arms deal "press frenzy" was initiated by "none less (sic) than Richard Young who has issued a tissue of lies". The fourth action is a defamation claim against Baqwa for telling the press that Young is a "coward". With so much at stake, one might expect evidence of anxiety, but Young seems unflappable. "Are you nervous?" I venture. "Why should I be?" he snaps. "The opposite is true. The respondents must be very nervous people." Is he confident of winning? "One can never be one hundred comma zero percent sure, but I am upwards of 90% confident I will win." Asked to describe himself, Young smiles, "Overweight, overworked, greying around the temples." Why is he persisting in his battle? "I am fortunate to be master of my own destiny. I don't have a boss or shareholders to tell me what I can and cannot do, or that I am crazy," says Young. "I'm an avid supporter of South Africa and it irks me to see corruption, cronyism and nepotism creeping in wherever there is empowerment. I know in the long run that will be the downfall of this country. I am prepared to fight back." Young prides himself in being "able to control my fear", an attribute he ascribes to spearfishing. He does this regularly in open water in the Cape, especially on the Agulhas banks, where there are large numbers of great white sharks. "One, firstly, just has to want to do it. The risk analysis makes one realise that the odds are that one won't get taken." When all the court action is over, Young will, at best, receive financial compensation in the form of the R150 million lost in his deselection, plus interest. "We can't get the deal back because the project is too far advanced." Asked whether he believes the arms deal is corrupt, he replies: "Absolutely. There is no question in my mind. It is simply an enrichment exercise for the black elite. There was no reason to buy so many things at one time. We should have bought the Corvettes at the time but there was no reason to buy the most expensive German ones. The Spanish offered the lowest price and the highest industrial participation but we went for the most expensive option. The value of the industrial countertrade offered by the German naval consortiums involving steel production and stainless steel fabrication was wildly exaggerated, while the feasibility of the projects was dubious - as has already been found to be the case." Asked to expand on the information he hopes to acquire, Young responds: "I want those draft reports and other documents that will indicate whether a proper forensic investigation was done. "I believe that the way ADS got us out of the equation was by loading our price with about 120% risk, making our system too expensive. That particular aspect comes up in the auditor-general's original special review, but is utterly inadequately addressed in the published report." Despite the setbacks of losing the massive Corvette bid, C²I² Systems is thriving and even has two contracts on the Corvettes, involving different subsystems, won through other companies. More than 50% of their work is international. The latest U.S. Navy ships use C²I² Systems network technology. The legal action has taken up an enormous amount of Young's time for five years. "I have had to work 60- to 70-hour weeks rather than 40-hour weeks." But he continues to love his work. What does he do to relax? "I have a lovely 22-year-old girlfriend, and a lively 22-month-old English Pointer puppy. I have a house 50 metres from the sea at Cape Agulhas, where I spend more than half my time. I relax by spearfishing and diving. I also have a 1 200-hectare fynbos farm very close to the southern tip of Africa, which I am developing into a private game reserve." But relaxation is not on top of his agenda, until Young's legal ordeals are over. "What irks me big time is that the arms deal has mopped up every cent of the SA National Defence Force funds so they cannot really proceed with day-to-day projects. They have taken away all the money and there is none left to keep the SA National Defence Force as an operational force." With acknowledgements to Susan Segar and The Natal Witness.